Captain Clockwork Special, published by Captain Clockwork Comics, 32 pages. A family of time-travelers help protect humanity and the time stream over generations by preventing or allowing certain events in history. This is the premise of Glenn Whitmore's Captain Clockwork Special, a comic that turns out to be a pleasant diversion from today's multiple crossovers and gimmick-laden "events." After years of service in the "family business" as Captain Clockwork, Professor Dean Walters develops robot sentries for the job, believing that humans are incapable of making the difficult decisions needed when dealing with the time stream, due to their "emotional involvement". He also finds out, to his displeasure, that his daughter Deanna has been training to be the next Captain Clockwork. More than the danger, however, Walters has been trying to protect her from a tragic event in her family history, an event which must take place. Captain Clockwork is one of those projects which appear quite simple on the surface, but contain the pleasant surprise of complex characterization and motivations. 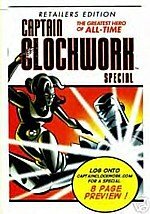 All compliments aside, however, the dialogue for Captain Clockwork comes across as "stiff" and unrealistic at times, which could undermine the considerable drama of this book. I know a couple of comics professionals have likened the book to the fun four-color works of a simpler era, and I agree with that sentiment. Personally, however, I believe dialogue ought to be kept applicable to today's standards of story telling if creators wish to reach new readers. If Whitmore was going for pure nostalgia for longtime fans, however, he gets props! Captain Clockwork is recom-mended for all ages. Find it at comics shops, online retailers and at www.captainclockwork.com .